When browsing your articles page you may have noticed a new link: trending articles. Trending articles gives you a glimpse into which papers the rest of the metajournal community, with similar clinical interests to you, are reading, sharing and studying. These are not necessarily the latest or most recent articles, but rather those that currently most interest metajournal users who follow the same journals as you. Next to the trending tab, you will also find a link to the latest articles - showing the newest articles published from all the journals that you follow in your metajournal account. This is a great way to dip your toe into the waters of the latest published research in your field, browsing through the freshest and newest papers. Between metajournal's article suggestions, trending and latest articles, you will be certain to find something that not only interests you – but also improves your practice. Metajournal now suggests related articles underneath the abstract you are reading. This is a simple feature that may have a dramatic impact on your understanding and appreciation of the greater body of evidence surrounding a topic. 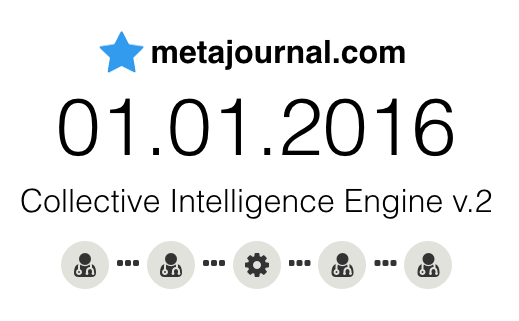 Metajournal goes a step further than PubMed's suggestions of related articles, by not just considering the similarity of titles and abstracts, but by also leveraging the machine learning of the metajournal Collective Intelligence Engine to consider article significance, relevance and quality. 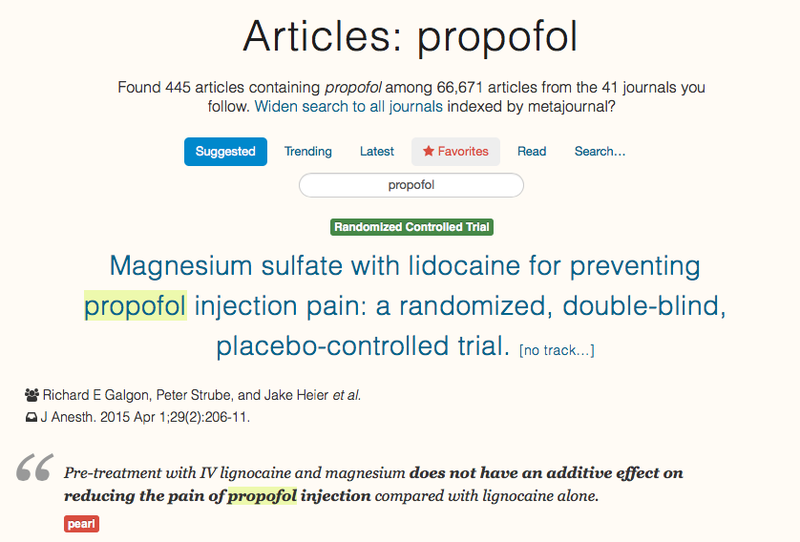 For nice examples of Related Articles in action, have a look at the SAFE study (NEJM 2004) and the B-Aware trial (Lancet 2004) – where the suggested 'related articles' include both interesting papers and more recent studies that may otherwise not be seen. Metajournal has extensive search features allowing logged-in users to search within article titles – either from among the entire 844,468-articles index, or just a smaller slice. Simply click Search... and enter your search terms in the box. 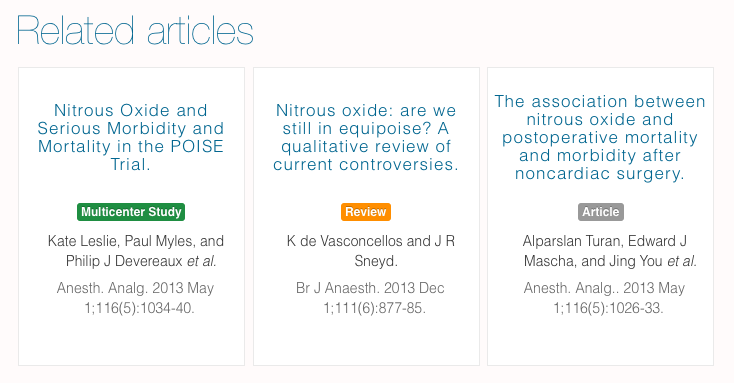 Search within your Suggested Articles, your Favorites, articles from one Topic, or among articles from just one Journal. From there you can widen the search to metajournal's entire article index, or then even perform the same search on PubMed. And if that's not enough, you can also search metajournal's Collections and Notes too! You can easily follow extra journals with metajournal, and so increase the range of publications used to recommend personally-relevant articles. The easiest way to add extra journals to follow is via your settings page. Click on Journals and from there you can easily search for new journals to follow by name, or unfollow journals that no longer interest you. When you first join metajournal, you automatically follow all the main publications from your specialty. However by refining your list of followed journals you can fine tune things further. If you follow journals outside your specialty, its important to tell metajournal what your clinical interests are by following a good number of Topics (at least ten). Metajournal uses the topics that you follow to predict and suggest specific articles that are relevant to your practice, even if they are published in journals outside your specialty.